A cottage like this would be repaired and rebuilt many times in its life. By the 1970’s, the cottage was in a poor state of repair, and was derelict. The restoration by the local Greiner family saved the building, and it became a home again. By 1990, the cottage was again empty and derelict, and was given to Solway Heritage by the then owner, Mr Ian Mills along with a donation of £1,000. Solway Heritage prepared a scheme of repairs, and supervised the restoration in consultation with Historic Scotland. The majority of the work was undertaken by master thatcher Jeremy Cox of Corsock, ably assisted by his wife, Jools, with the large crucks and other main timbers being repaired by craftsman Mike Todd. Careful attention was given to good conservation practice and the use of authentic materials and workmanship using traditional tools. The crucks were first dismantled and numbered, so that they could be reconstructed and replaced in their original position. It was only when the backs and bases of the crucks were first revealed, that the full extent of the repairs was discovered. 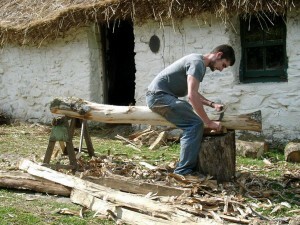 Tree trunks and branches were chosen to match the shape of the existing crucks. The new wood was carefully spliced into the old to make a strong repair. Walls were re-pointed and wall tops re-bedded in traditional mortar. The hanging lum was re-constructed using a timber frame plastered in mud, cow dung and lime daub. Finally the roof was re-thatched using wheat straw over heather turf. Outside. Roger Lewis, the drystane dyker from Twynholm, Kirkcudbright, constructed the dyke and laid the cobbled driveway. Notice also the wooden gate – constructed without nails! Minor repairs were carried out in 1998 and in 2004 the roof of the cottage was again repaired and re-thatched by Jeremy Cox. 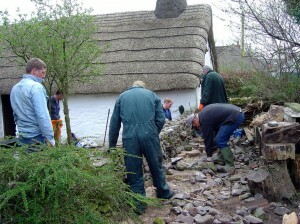 Repairs were undertaken again in 2012 and fundraising is underway to repair and re-thatch in spring/summer 2017. The members of the Cruck Cottage Heritage Association now take responsibility for the day to day upkeep of the cottage, and carry out minor repairs, limewashing, etc, using traditional materials. It is essential to maintain the cottage in its present condition, and ensure that it never again falls into disrepair.